Solar radio images obtained by SRH at 5.2 GHz in total intensity and polarization after cleaning procedure during the first negative burst (left) and after it (right). The negative burst is related to the screening of the northern source on the east limb. The axes show arc seconds from the solar disk center. Credit: Lesovoi et al., 2017. (Phys.org)—Russian scientists have presented the first results of solar observations made with the new radioheliograph of the Siberian Solar Radio Telescope (SSRT). The Siberian Radioheliograph (SRH), has recently commenced regular observations of active processes in the sun's atmosphere, which will allow better monitoring of solar activity. Results of the initial SRH observations were described in a paper published Apr. 25 on arXiv.org. SRH is a 48‑antenna array with a 4–8 GHz operating frequency range and a 10 MHz instantaneous receiving band. The instrument is installed on the SSRT telescope of the Radioastrophysical Observatory (RAO), located in the Eastern Sayan Mountains, about 220 kilometers away from Irkutsk. While the adjustment of the SRH system is still in progress and the array is still incomplete, the first stage of this instrument has already provided promising preliminary results. SRH started single‑frequency test observations in early 2016, and since July 2016, it has routinely observed the sun at five frequencies. During this period, solar activity was low, which offered a great opportunity to test the capabilities of this instrument. "This allowed us to assess capabilities of the new instrument to study faint events, which cannot be detected by total‑flux telescopes," the researchers wrote in the paper. During preliminary observations, SRH recorded three negative bursts, which occurred on one day. These bursts are temporary depressions of radio flux below the quasistationary level, caused by screening of emission from compact radio sources or quiet solar regions in low‑temperature plasma ejected into the solar corona. They are very rarely observed and provide essential information about eruptive events. While conducting observations of the solar disk at different frequencies, SRH also recorded few powerful M‑class solar flares. High sensitivity of the radioheliograph allowed the researchers to observe the microwave emission from these flares without attenuators. In general, the first observations provided satisfactory and promising results, proving that SRH enables the implementation of fast and effective algorithms for solar imaging without the need of reference observations of other cosmic sources. The scientists pointed out several main advantages of this array. "Advantages of SRH are as follows: the temporal resolution high enough to study many processes (up to 0.56 s for both circularly polarized components in the single‑frequency mode), multi‑frequency observations with a tunable frequency set depending on observational program, image synthesis with optimization of required parameters (for example, spatial resolution or sensitivity), and the absence of geometric distortions from which SSRT images suffered," the paper reads. The SRH system will eventually be expanded to 96 antennas, which would improve its spatial resolution. This would enable the instrument to study processes of initiation of coronal mass ejections (CMEs) and their propagation up to heights of one to two solar radii, thus filling the gap between observations in ultraviolet and optical ranges. "Expansion of the antenna array up to 96 elements would be the next milestone in upgrading SRH. The spatial resolution of SRH‑96 would be as high as 15," the authors noted. 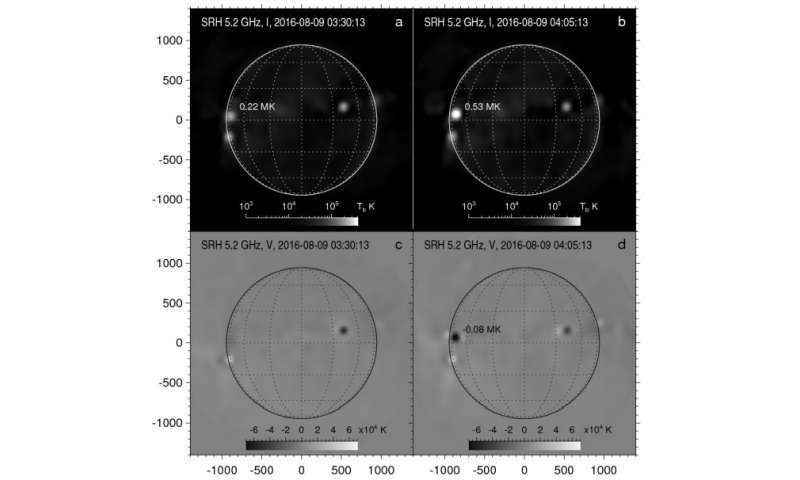 Regular observations of active processes in the solar atmosphere have been started using the first stage of the multiwave Siberian Radioheliograph (SRH), a T-shaped 48-antenna array with a 4-8 GHz operating frequency range and a 10 MHz instantaneous receiving band. Antennas are mounted on the central antenna posts of the Siberian Solar Radio Telescope. The maximum baseline is 107.4 m, and the angular resolution is up to 70". We present examples of observations of the solar disk at different frequencies, "negative" bursts, and solar flares. The sensitivity to compact sources reaches 0.01 solar flux units (≈10−4 of the total solar flux) with an accumulation time of about 0.3 s. The high sensitivity of SRH enables monitoring of solar activity and allows studying active processes from characteristics of their microwave emission, including faint events, which could not be detected previously.